“Upward mobility. How to make the move from EMT to paramedic.” JEMS (2001): Margolis, G., Golesorkhi, R.
Dr. Reza Golesorkhi is a board-certified Internal Medicine physician, treating adult patients in the Woodbridge, VA area and surrounding communities at his practice, Potomac Internal Medicine. Dr. Golesorkhi treats patients for a variety of reasons including acne, psoriasis, sinus problems, sleep problems, swelling in the neck, ear infection, annual physical, and more. 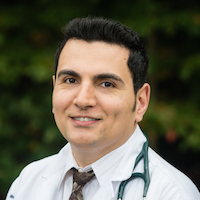 Dr. Reza Golesorkhi graduated from the American University of the Caribbean School of Medicine in 1998 and completed his internship and residency at Danbury Hospital, Yale University School of Medicine Affiliate, in 2002. He practices medicine in Woodbridge, VA, and specializes in Internal Medicine. Dr. Golesorkhi was chosen for the Northern Virginia Magazine “Top Physicians” award in 2013 and 2014. He has also been a recipient of the Patient’s Choice Award for six consecutive years (2008-2013).